Influencers are more active endorsing beauty brands through Instagram Stories than on Snapchat, but smaller beauty brands still thrive very well on Snapchat staying under the radar while engaging their audience. August 9, 2017 — Snaplytics is a marketing platform for new social channels including Snapchat and Instagram stories. In August they will launch their Brand Listening service to analyze brands share of voice among influencers and which influencers are most active on the story based platforms. Snaplytics analyzed over 800 influencers in depth over the last quarter, to identify how many updates contained brand mentions, which brands were being mentioned and who mentioned them on what platform. It turns out while Snapchat has had a downward going slope in terms of influencer activity Instagram Stories is gaining more and more traction, especially among larger brands. There are a large group of smaller brands utilizing influencers on both platforms, but the share of small brands on Snapchat is almost 8% larger than on Instagram indicating many smaller brands enjoy navigating under the radar engaging their target audience, whereas larger brands utilize Instagram Stories to a larger extent. A reason for larger brands preference towards Instagram Stories could be easier reporting on the results of the campaigns. The Snaplytics Quarterly Report for 2nd quarter also revealed that brands are getting smarter about gaining followers on Snapchat. 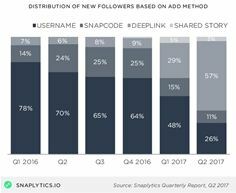 Previously “added by username” was the predominant way for users to find brands on Snapchat, but in 2nd quarter more than half of the new followers added through Deeplink and only 26% through Username. Once added on the platform, previous research has shown 54,8% of followers will open the brands stories and 91% of those opening the stories will watch in full. On average brands post 9 snaps in a row of 90 seconds 3.25 times a week. Over the last 4 quarters the completion rate has increased while the consensus of the optimal length is moving towards 9 snaps in a row for a story. “There is a lot of debate about Snapchat vs. Instagram Stories. I do believe the data shows there is room for both, and each has something unique to offer to their users – Instagram for scale, Snapchat for intimacy – both with excellent ROI”, Thomas Cilius, CEO & Co-Founder Snaplytics. Snaplytics is a SaaS company focusing on providing Snapchat and Instagram Stories analytics for brands, agencies and influencers. Snaplytics analyzes usage statistics, including views, average number of screenshot per story, and average story duration, and provide industry benchmarks to help marketers determine if they are creating compelling campaigns and reaching their target audiences. For more information, visit https://snaplytics.io.